Congrats to yourself & the Borough faithful. A fantastic effort by a team fully committed to the cause. All my expectations went out the window. I thought that Port would struggle on the bigger ground & would be too slow for the young Richmond rockstars but when you reflect the likes of Morris, Hampson, Marich etc none of who gave a yelp & are all past their time. I would suggest one of Ports greatest victories that will not ever be forgotten. Not by me anyway. Well done to all the faithful. Ten years ago, a very senior employee at AFL Victoria confided that the organisation were of the belief that no VFL standalone side could ever hope to win the premiership. Since then, there have been three standalone premiers and two more runners-up. It's phenomenal that Port Melbourne's players had the fitness base to run out the game. The fact that they could demonstrates how good planning and a strong club culture can still cut it. The spirit of the borough was enormous yesterday. In 2011 it was Port, 2015 Willy and now Port again. 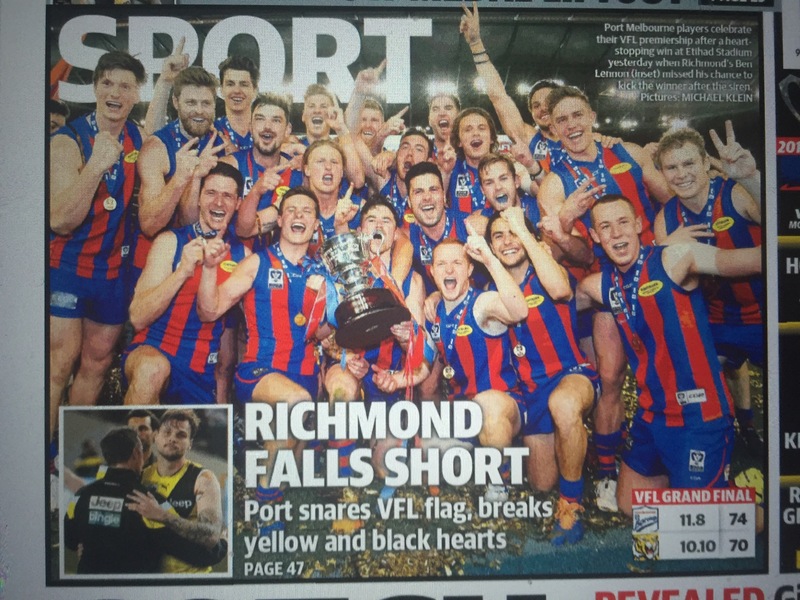 Who said the VFL standalone (old VFA clubs) can't win flags ??? Yeah there were a few ouzos at the Rex, stayed there till closing time. Robbo i expected support from Frankston and Coburg fans but a tad suprised about Williamstown considering the sporting rivalry of the two great clubs and considering the prelim result. Supprisingly their is some support for each of those clubs when the other is not playing. I don't hate Williamstown by any means, a great club, very passionate and very well run - however find it hard to support them as don't want them to reach our primiership total. Billythekid - nice to meet you albeit briefly yesterday. VFA theirs a photo with you and Toby and the cup. James is also in the photo, do you want me to get you a copy ? For sure. Please get a copy. Sent to your email georgie boy - its a top picture.